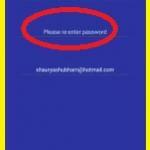 You know guys, what is the reading mode Android oneplus 6t? Reading mode is best and relatively new feature of the oxygen OS that adjusts your device display color. reading mode is an astounding feature provided oneplus 6t. it gets clear of color generally. Reading mode is powerful features that you can use it during the writing an essay in Google docs and scrolling through Twitter, also reading E-book and other activity. Reading mode most useful features because it’s helpful for our health. Reading mode cancels blue light that navigates sleep cycles. and cause eye strain. 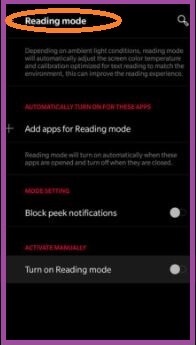 a reading mode can make disparate between physical and mental health.follow below How to turn on reading mode in OnePlus 6t article steps and use it. reading on oneplus 6t and other smartphone screens can be uncomfortable. OnePlus 6t make it in easy on your eyes with the custom read mode. 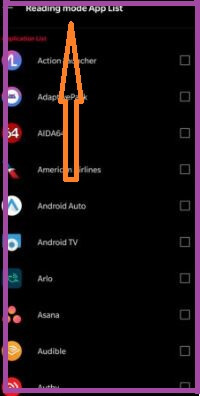 here are the steps for How to enable reading mode in OnePlus 6T Android Pie 9.0. Set 1: Swipe down the notification panel from the top of the screen. Set 2: Tap Setting gear icon. Set 3: Tap Display setting. Set 5: Tap Add Application: Reading mode app list. Set 6: Select App that you want automatically turn ob reading mode. that’s it now, Automatically enable reading mode in OnePlus 6T. Reading mode improves your reading experience also it automatically adjust screen color and temperature. open setting tiles: now, Long press reading mode. now, you can see your mobile display Grayscale. Like it and Share it with your friends to get more tips and tricks on OnePlus 6t in free. 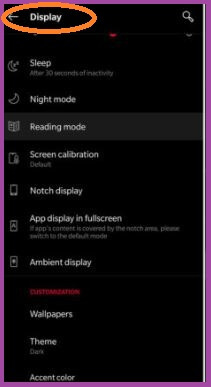 Feel free to comment us if you found something missing in this article “How to Active Reading Mode on OnePlus 6t” and share your idea.